Blu Dot is a Minneapolis-based designer and maker of modern home furnishings, with the goal of bringing well-designed furniture and home decor to as many people as possible. They work closely with Optimizely Solutions Partner, Clearhead, to build and scale a successful optimization program that fuels their business. For Blu Dot, optimization plays a major role in advancing business objectives and tackling organizational challenges. According to Mike Wodtke, the company’s director of e-commerce, Blu Dot adopted optimization because they wanted a more cost-effective way to drive sales. Rather than continue to throw more traffic at their website, Wodtke believed that building a better, more optimized experience for existing customers would do more to move the needle. The following examples highlights two high impact tests that Blu Dot ran, in partnership with Clearhead, to advance defined business goals. Blu Dot’s retail website offers a robust offering of different products, some with varying color options and other product details. But this information was not presented to shoppers on the broader category page, where they were typically browsing. Shoppers instead had to click through to a product detail page to learn what colors an item came in. They’re already there, why not make it the best darn experience you possibly can. The Blu Dot and Clearhead teams believed that this additional click was having a negative impact on purchases, so they decided to run a series of tests to surface product detail information higher in the funnel. They hypothesized that adding color selections to category pages would increase clicks, adds-to-cart, and order conversions. They tested spectrum of ways to show different color swatches for Blu Dot’s products. One variation showed a circle with a multi-colored design and the number of colors available next to each product. Another focused on text only, displaying the message “Available in X colors” next to each product. Another version displayed simple color swatches; and the final variation showed functional color swatches that, when clicked, would change the color of the product displayed on the category page. The winning variation – the text only display – increased total order conversions by 62.4%. 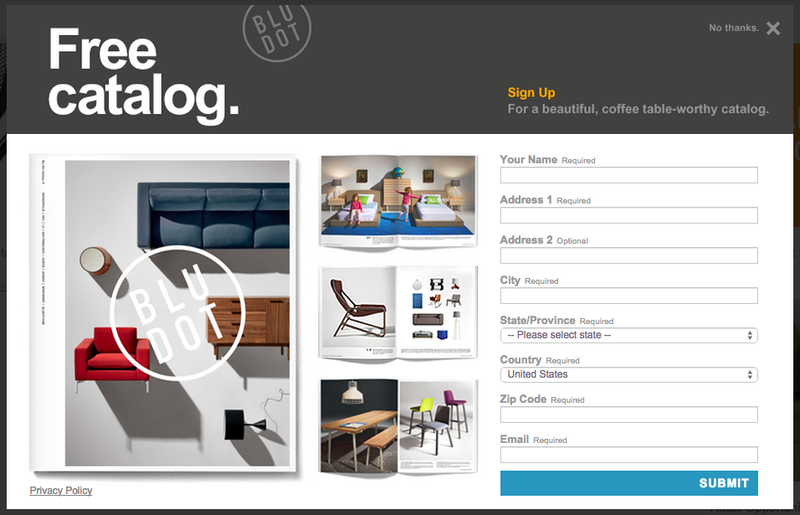 Blu Dot originally featured an email capture modal when customers visited their website. They hypothesized that if they replaced the email modal capture with a “Free Catalog” modal capture then conversions to catalog request would go up. Why a free catalog? Blu Dot knows its shoppers value design, and that the shopping experience for furniture is often a longer, more thought-out process than for other retail goods. They believed that shoppers would see greater value in signing up for a catalog by mail than they would in providing their email address for a newsletter. Blu Dot hypothesized that if they replaced the original email capture modal with this “Free Catalog” modal then conversions would increase. The results were staggering. The catalog request modal increased conversion rates (that is, the number of customers who submitted their information via the modal) by 124%. Not only did the new modal increase conversions tremendously. It also provided Blu Dot with something equally as valuable – more specific information about their customers’ physical location. “As a multi-channel retailer, it’s important for us to be able to understand where a customer lives. Sometimes we offer deals at in-store events. Plus, people tend to buy things differently online than they do in a store – especially for our business,” explained Wodtke. Understanding where their customers are physically located helps Blu Dot connect online and offline events, and increase sales both on their website and in stores. We can spend an infinite amount of money bringing people to our website, but if we can’t get them to transact in the way that we want them to – making a purchase, signing up for a catalog, or something along those lines – what does it matter?